For businesses, understanding the principal drivers of exchange rate movements can be key to managing cash flow and FX risks. To achieve such understanding, businesses may wish to know how traders – who are the principal drivers of exchange rate movements – incorporate forex technical analysis into their trading decisions. Traders predict exchange rate movements using both “fundamental” and “technical” analysis. Businesses may be more familiar with fundamental analysis, since it is concerned with how exchange rates respond to the same economic indicators and world events that businesses incorporate into their own planning. But they may be less familiar with forex technical analysis, which uses historical exchange rate patterns – and a lot of math – to predict future exchange rate movements. This article provides an introduction to forex technical analysis for businesses. For example, if traders think that the Federal Open Markets Committee (FOMC) is going to raise U.S. interest rates, they may adjust their bid/offer rates for the U.S. dollar upwards. Thus the U.S. dollar exchange rate may rise days or weeks before the interest rate is announced, rather than at the time of the announcement. The FX market is said to have “priced in” the interest rate rise. The concept of “pricing in” is key to forex technical analysis. The Efficient Market Hypothesis says that everything that can be known about the fundamentals of a currency both now and in the future is priced into its exchange rate.1 Since every historical exchange rate thus includes not only historic fundamental information but traders’ expectations of future fundamental information, historical exchange rates can be a guide to future exchange rates. However, the FX market can be volatile. In the very short term, currency exchange rates can move up and down in unpredictable ways. Technical analysis tries to look through this forex “noise” to identify longer-term trends. In this close-up, the trader’s preferred position is “short” the euro, which implies an expectation that the exchange rate will fall and is therefore bearish. So “head and shoulders” is a bearish reversal pattern. Double tops and double bottoms are reversal patterns that are, respectively, bearish and bullish. Double top tests “resistance” twice before falling: the EURCHF “head” shown in the EURCHF close-up above is a double top. Conversely, a double bottom tests “support” twice before rising. Triple tops and bottoms are similar forex technical analysis patterns but have three “bounces” instead of two. For example, in the first USDJPY chart above, the period from late March through mid-April is an ascending triangle which eventually resulted in a sharply rising exchange rate. It is a bullish reversal triangle. Wedges usually break out in the opposite direction from the angle of descent, so a descending wedge is bullish and an ascending wedge is bearish.7 They may be reversal or continuation patterns depending on the previous trend. For example, in the February-March time frame of the first EURCHF chart there is a descending wedge which reversed the previous downward trend, resulting in a sharply rising exchange rate. This is a bullish reversal wedge. Patterns on forex charts can be defined by “support” and “resistance” levels. Thus, in the first EURCHF chart above, the exchange rate several times appears to “bump along” a line at around 1.14925. This is known as a “support” level. It is the level at which buying starts to exceed selling, so the exchange rate stops falling and may reverse. Of course, exchange rates can break through support levels. On the EURCHF chart, there is a second support level shown at about 1.142. 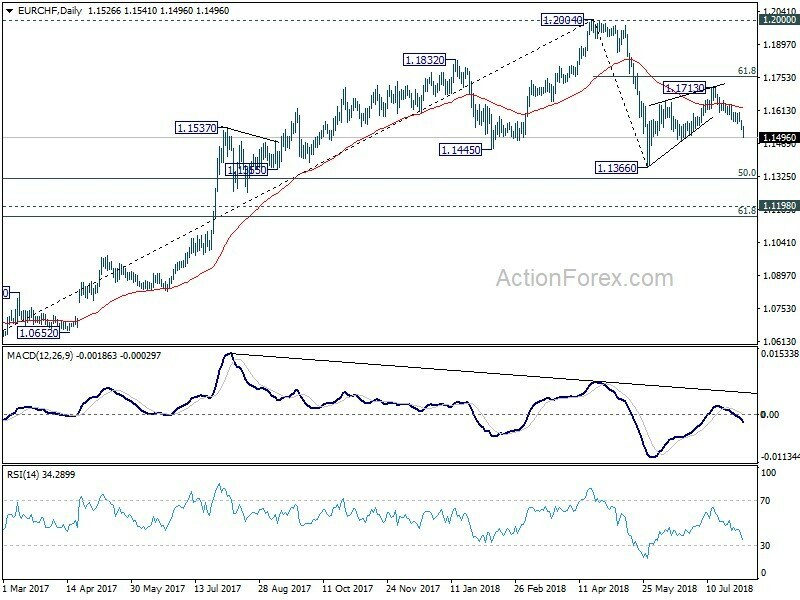 This is because the EURCHF exchange rate has just broken through the 1.14925 support level, so forex technical analysts are looking to the next lower historical support level, which was hit but not broken at the end of May. The EURCHF chart also shows that the exchange rate has several times hit a ceiling, along which it has “bumped along” before falling. This is called a “resistance” level. For example, from mid-April to mid-May, the EURCHF exchange rate hit a resistance level at 1.2000, tested it, then eventually fell. During that time, buying and selling activity was roughly balanced, but from mid-May traders switched from buying the euro to selling it. As with support levels, currency exchange rates can break through resistance levels. When a currency exchange rate breaks through a resistance level, that resistance level becomes a support level when the exchange rate next starts to fall. Similarly, when a currency exchange rate drops through a support level, that support level will be a resistance level when the exchange rate rises again. Patterns thus tend to be persistent and repeating. Support and resistance are not the only indicators that technical analysts use to help them understand and predict forex movements. There are numerous additional indicators that can help give a more detailed picture of the currency exchange rate world. “Leading indicators” precede exchange rate movements and can help to predict them, while “lagging indicators” respond to exchange rate movements and can therefore confirm existing trends. Here are some of the most widely used indicators. Simple Moving Average (SMA) is the average price over a set time period, for example 20 days. It is a lagging indicator which is useful for confirming the direction of a trend. Multiple SMAs for different time periods can help to identify trend changes, since trends often change when longer-period SMAs cross shorter-period SMAs. Exponential Moving Average (EMA) is like an SMA but it weights the most recent data points higher8, and thus responds more quickly to exchange rate movements than SMA. Trend reversals are indicated by a longer-period EMA crossing a shorter-period EMA. Forex technical analysis can be complex and may require strong mathematical skills. Fortunately, most forex charts include preset technical indicators, and many forex chart providers also supply technical analysis and commentary. A basic understanding of forex charts and technical indicators may thus be sufficient to enable businesses to use technical analysis effectively when managing their currency exchange rate exposures.